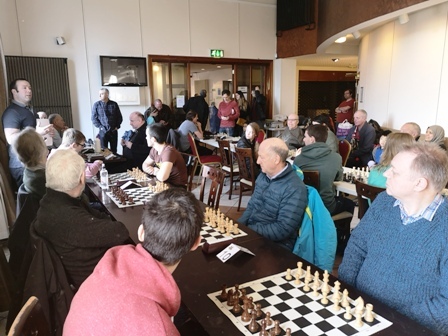 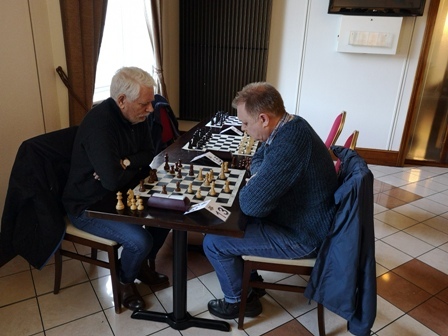 52 players flocked to Newry from across Ireland, both North and South, on a very cold February morning to the excellent council venue - Sean Hollywood Arts Centre. 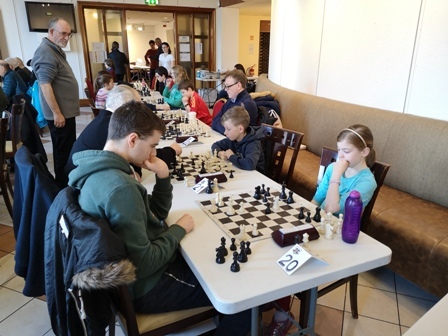 There was a great turnout from Omagh (with 10 players);4 from nearby Armagh, 6 from Dublin, 5 from Bangor, 2 from Portadown, 3 from Hillsborough, 2 from Enniskillen, as well as a large contingent from several Belfast clubs. 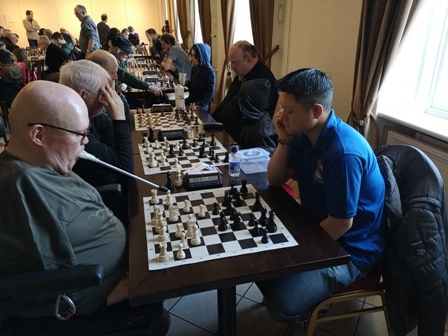 These consisted of many experienced battle hardened veterans but it was also great to see many young players making their tournament debuts. 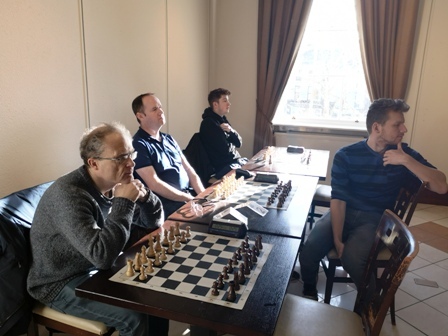 The 25 minutes each player Rapidplay format maybe does not suit some players, but it does lead to some very exciting finales. 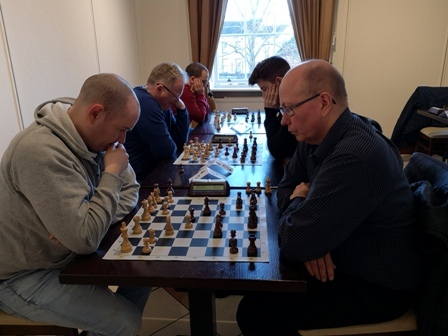 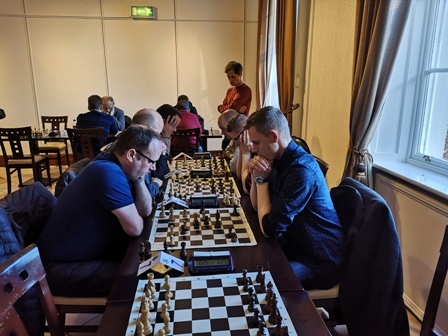 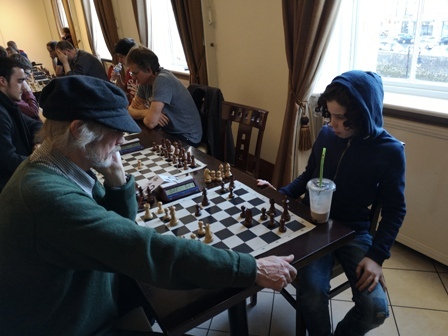 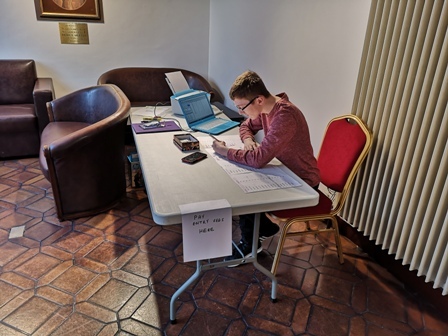 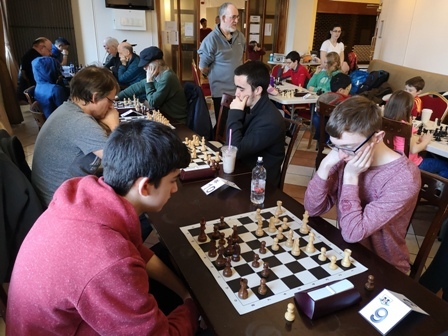 There were some notable competitors in top seed 19 year old Irish Olympiad player FM Conor O'Donnell (2205) from Gonzaga Chess Club, Dublin and highly rated newcomers Rasmus Jorgensen (2065) from Denmark and Kamil Szulc (1582) from Poland. 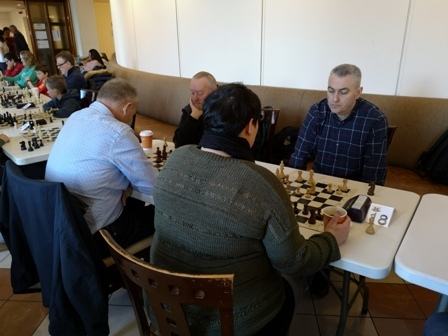 In the Senior section the winner, on 5.5/6, was fourth seed Gabor Horvath (Strand CC, Belfast) with a fantastic unbeaten performance, achieving a TPR of 2267. 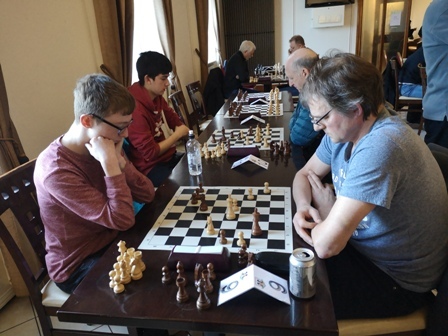 Runner up, scoring 5/6 and also unbeaten with an equally brilliant TPR of 2223, was eight seed Danny Roberts (Civil Service CC, Belfast). 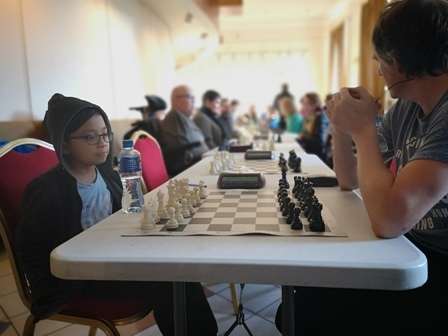 Both of these players beat the top seed Conor O'Donnell. 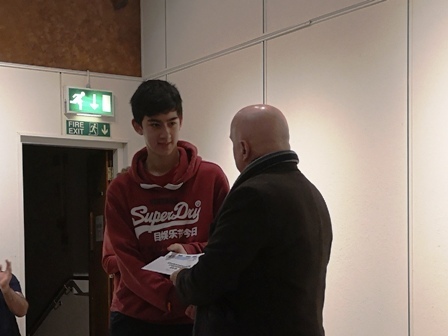 The Under 1700 grading prize went to David Hill (Strand CC, Belfast) scoring 3/6. 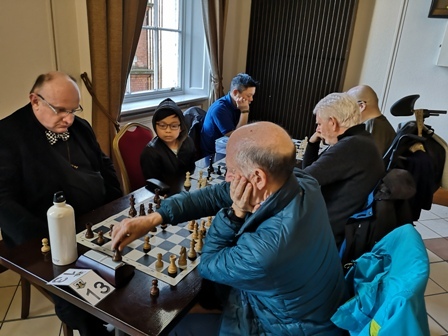 In the Intermediate section the winner, on 5/6, was 16 year old James Wong (Strand CC, Belfast), with a TPR 395 points greater than his rating. 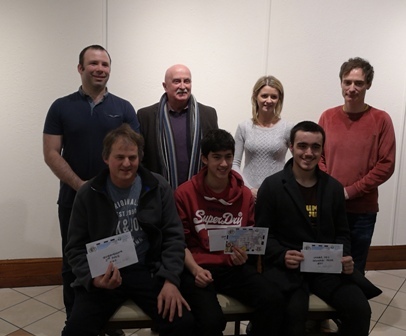 Runner up, scoring 4.5/6, was Adrian Gilmore (Omagh CC). 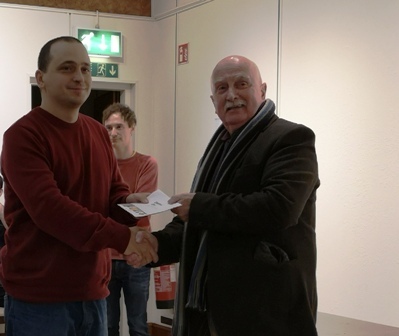 The Under 1150 grading prize went to Aaron Wafflart (Strand CC). 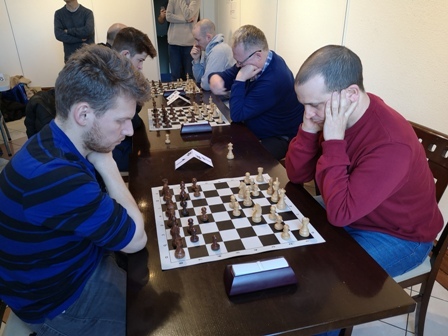 A measure of how competitive this section was that no player survived unbeaten. 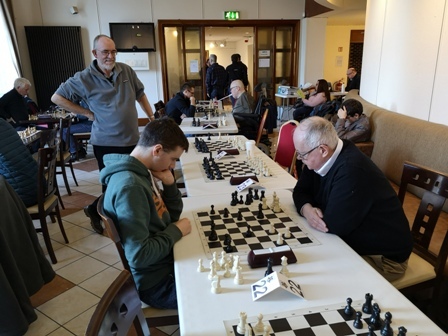 In the Junior section the winner, on 5/6, was Paul Anderson (Ballynafeigh CC, Belfast). 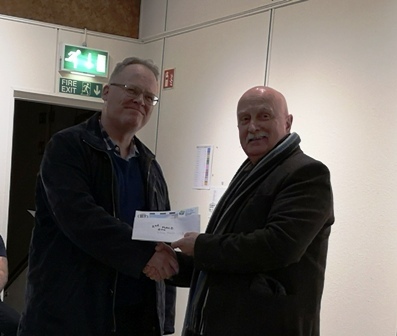 Runner up, on tie-break, also scoring 5/6 was Brian Fitzsimmons (Strand CC). 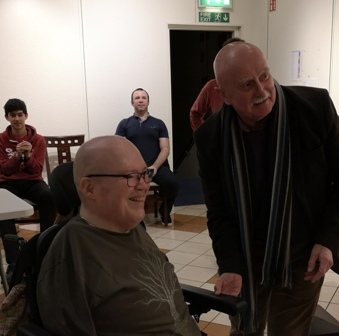 It was a double celebration for Brian on Saturday as it was also his birthday but he was keeping that score a secret. 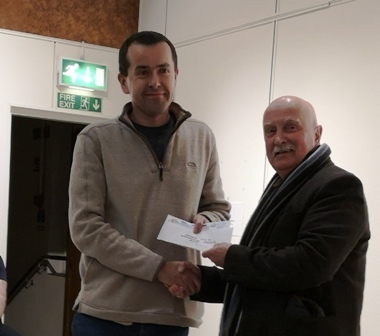 The Under 850 grading prize went Tom Johnson (Omagh CC), who came all the way from Enniskillen. 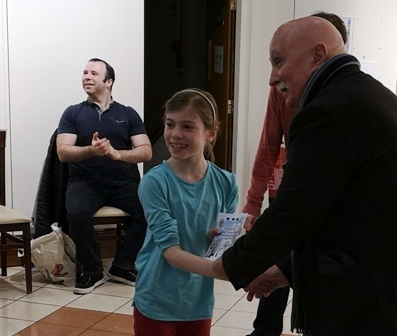 There was also a special prize for the top female player (out of a magnificent entry of 7 players) which was won by 10 year old Lucy Bueckert from Dublin. 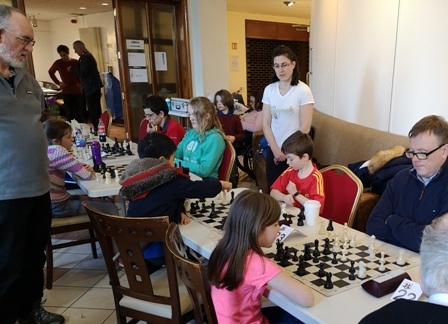 This was certainly the most competitive section - going into the last round 5 players were vying for top place. 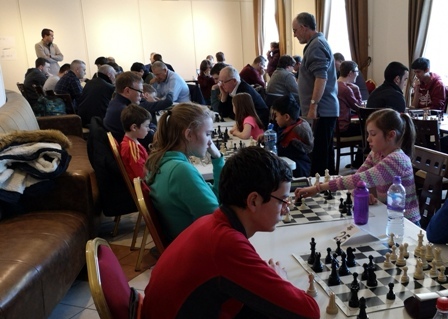 As in the Intermediate section, each player lost at least one game. 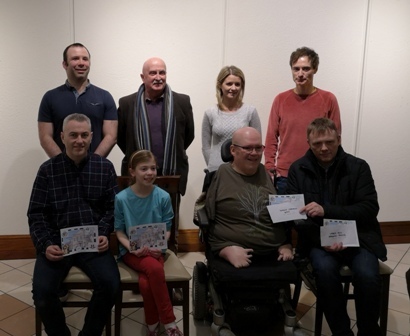 We were lucky to have on hand Councillor Charlie Casey who presented the Prizes and accepted the thanks of the players for enabling the event to take place. 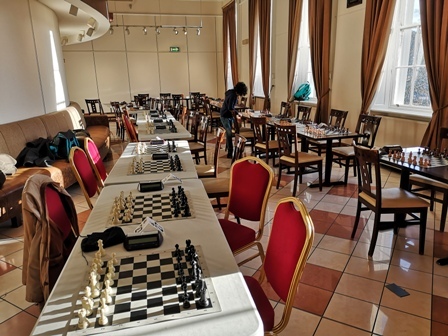 He mentioned that it was good to see chess played in such an excellent venue. 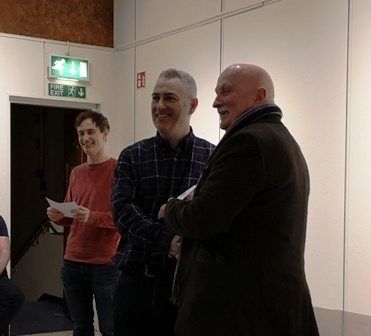 Many thanks to the superb Venue : Sean Hollywood Arts Centre and to the Newry, Mourne and Down District Council for Sponsoring the event. 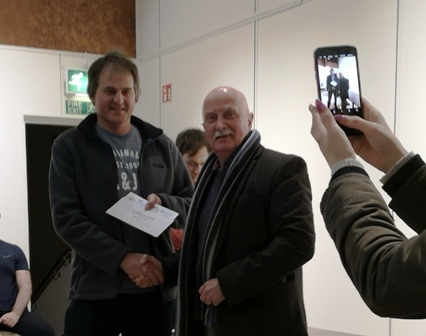 Also thanks to Brendan Jamison for his tireless work to organise and run the competition. 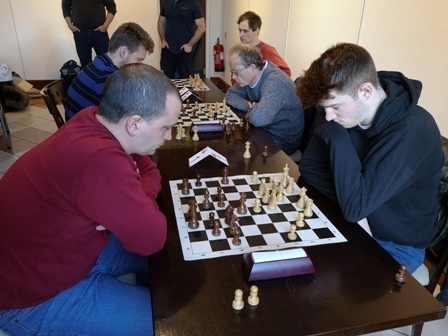 Thanks also to the Chief Arbiters: Brendan Jamison and Ross Harris, Assistant Arbiters: Evan Elwood, John Bradley and Adam Rushe. 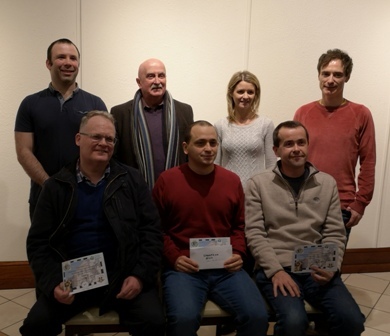 Thanks also to the ICU for rating the competition and supporting the event. 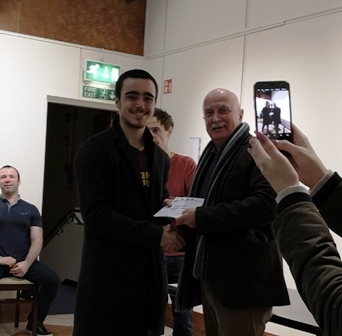 Councillor Charlie Casey Presenting the Prizes.